The best approach road to the Tuweep area of the Grand Canyon National Park is the east side of the Mount Trumbull loop, which joins AZ 389 along the straight section from the Pipe Spring National Monument and Fredonia, between mileposts 24 and 25. Much of the first 10-15 miles is quite severely graded making for a very bumpy ride but the surface improves somewhat thereafter and the route remains quite wide and level for a further 15 miles - across the wide open Antelope Valley then down into the very upper end of Hack Canyon, a scenic tributary of Kanab Canyon, itself a branch of the main gorge and into which a 4WD track extends for some 20 miles. The main road begins to become more steep and winding, and the surface deteriorates slightly when approaching Mount Trumbull. 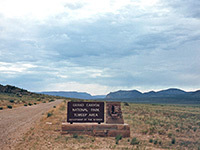 The middle of the three Tuweep access roads (Clayhole Road, from Colorado City) merges from the west, and 6 miles beyond a left turn (the Toroweap Point Road) heads due south towards the canyon, while the main track curves around the south side of Mount Trumbull back west 90 miles to Cedar City in Utah. The approach towards the national park is through a wide valley with grassy meadows and patches of lava. Occasional ranches are scattered over the land and remnants of older settlements include the preserved Tuweep Church, abandoned since the 1920s. The Toroweap Ranger Station is one mile inside the park boundary, ten miles from the canyon edge; this is available for advice and emergencies but has no regular facilities. 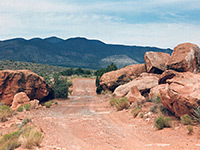 The road is in reasonable condition for another 7 miles along the valley, until it takes a left turn and crosses up-and-down, rocky terrain for the final three miles; with care, though, 2WD cars with good ground clearance can be driven all the way to the primitive campground near the canyon edge, at which there are ten spaces spread over a rocky plateau, within sight of the canyon although still half a mile from the edge. 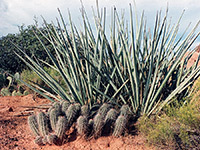 Two day use sites are available directly on the rim, at the end of an even rockier road. Visitors should be advised that towing charges in the event of vehicles becoming stuck or damaged are in the region of $3000.